When Aberdeen housewife Debbie Milne abruptly vanishes without trace, leaving behind her two young children, husband Scott is too distraught to sit out the police’s 72-hour window and await developments. He turns to local detective agency Harcus & Laird. Put off by previous “domestic” cases, Maggie Laird isn’t keen, but is cajoled by partner Wilma Harcus into a covert operation. Together they comb through meagre scraps of information, eventually trawling the city’s women’s refuges and homeless squats, in spite of the deadly danger. Then a woman’s body is discovered in a Dundee builder’s skip. With the clock ticking and the police struggling to make identification, the race is on. Claire MacLeary fashions a surprising, gritty, fast-paced tale with the warmth and wisdom of women of a certain age. 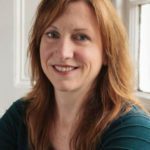 Claire MacLeary has lived in Aberdeen and Fife, but describes herself as “a feisty Glaswegian with a full life to draw on”. Following a career in business, she gained an MLitt with Distinction from the University of Dundee. 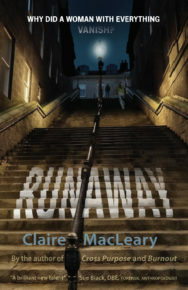 Runaway is her third novel and continues the Harcus & Laird series. Cross Purpose was longlisted for the McIlvanney Award 2017, and Burnout was longlisted for the Hearst Big Book Award 2018.